Despite the limited days this month, we sure did cram a lot of work into February. Between trade shows, user research playtests, and whatever shenanigans the community team got up to, we made the most of our time and achieved some really awesome stuff. Read on to get the details! So, our first Nintendo Switch title is announced now, just as everyone else making games also seems to be intent on giving Switch a try. It’s really quite exciting to see so many third party developers and publishers heading towards a Nintendo platform. Now we just gotta figure out how to make cartridges instead of discs. I think they’re different? Do we have a guy on that problem here? If the silliness behind those videos are any indicator, we’re in for something even more fun and over-the-top while working within the world of We Happy Few. February was a pretty busy month for me, especially with Valentine’s Day landing smack dab in the middle of it. Holidays are always a fantastic opportunity to engage our community, and Valentine’s Day allows for some pretty creative content! We created some awesome content for our We Happy Few channels, but our crown jewel was a truly delicious Valentine’s Day recipe! Elisa, Nicole, and I – channeling The Great British Bake-Off – whipped up these tasty Victoria Sponge Hearts over the course of an afternoon, and we were not disappointed with how they turned out! As a finishing touch, we awakened our latent cake decorating powers to bang out some shockingly beautiful (and easy-to-make) candy butterflies. These were added to mimic the effects of Joy, and they really added a lil’ something to the overall presentation. 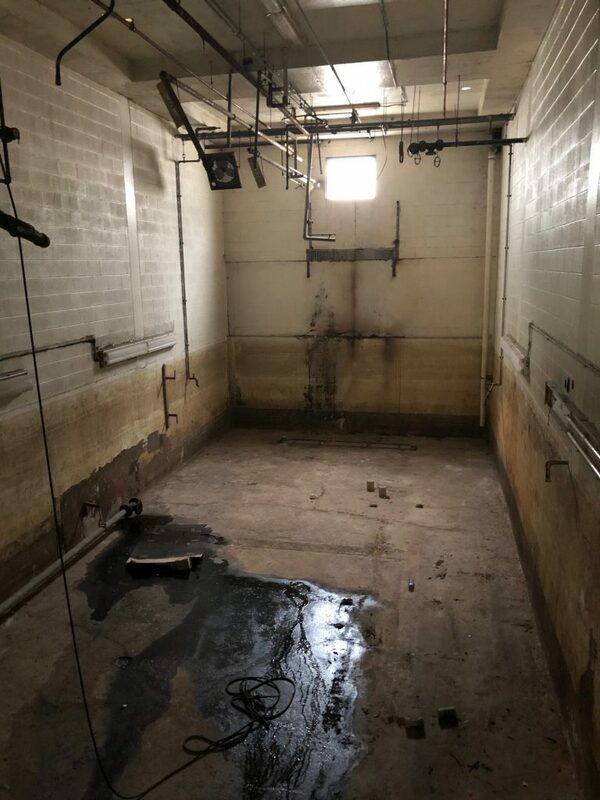 Projects like these are one of my favorite parts of the job. It’s really rewarding when your idea comes out just as you imagined, and even better when it’s edible! Beyond that, I supported several Publishing beats on social, including the announcement that Hello Neighbor is coming to Nintendo Switch! On a personal note, I finally finished Persona 5, which I’ve been obsessively playing every weekend since Christmas. Now that I’m done, I’m trying to re-learn what it’s like to be a responsible adult. Wish me luck! A lot can happen in such a short month, but thankfully February gives us a reason to cope via the consumption of a whole lotta’ sweets—especially the ones we whipped up for We Happy Few’s Valentine’s Day content block! This was by far my favorite of our We Happy Few recipes. I also made some moves behind the scenes—we’re taking a new influencer management platform for a spin, which will allow us to better communicate with the awesome folks that create video content and streams for our games. If you’re interested in making your way onto our influencer list, feel free to drop me a line (@ElisaRockDoc on Twitter). On a personal note, I was able to secure a date for my Ph.D. dissertation defense. This is a presentation where I tell my committee about the work I did (looking at gender in music games), things I learned, limitations, and contributions to my academic field. And then they grill me for the better part of an hour. It’s probably about as much fun as it sounds. If you could send me positive thoughts and cute cat pics on Monday, March 5th, it would be greatly appreciated. Stay tuned for the next Pub blog where I tell you whether I get to be called “Doctor” (not that kind, though)! Making marketing plans is a fun task because it requires us to take a step back and analyze the game from an objective view. To drop a fancy marketing term, we conduct what is called a SWOT analysis (Strengths, Weaknesses, Opportunities, and Threats), to help us know what features we should highlight and to what degree depending on the market and how it’s trending. We all feel very good about We Happy Few and can’t wait to get the campaign kicked off! In other news, I started Legend of Zelda: Breath of the Wild. In other, other news, I haven’t stopped playing Legend of Zelda: Breath of the Wild; Jeff has already yelled at me for playing at my desk. This month, Licensing team attended Toy Fair in New York, New York. We met with several of our current partners, as well as several new companies which we might collaborate with in the future. We also simply walked the show floor, looking for ideas and new connections, striking up conversations, and just playing with toys. Not to channel Captain Obvious or anything…but there were so many toys to look at. We saw everything from automatic spitball guns to baby chew toys to augmented reality wall decals to glow in the dark slime. Some things got the wheels turning for future collaborations, while other things were just fun to see/play with. I’m also happy to report that I realized the giant Gudetama was a person in a costume – rather than a robot – just before I sat on it’s lap. This month also saw the debut of the McFarlane figures for Lilith and Krieg. 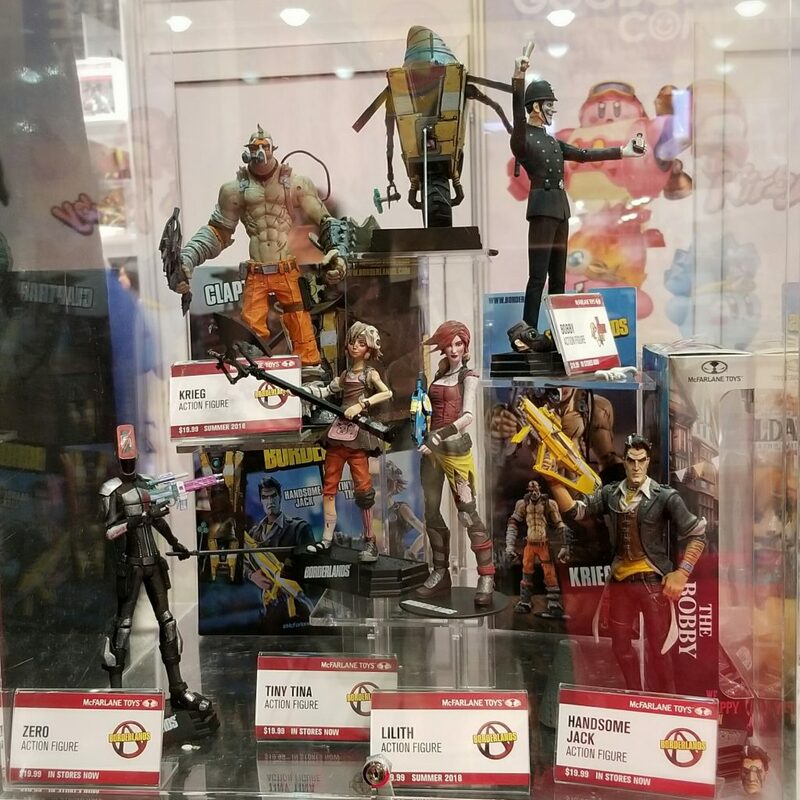 They were on display in McFarlane’s booth at Toy Fair with the other figures in the series (Zer0, Handsome Jack, Tiny Tina, and Claptrap), and are available for pre-order now. Check out our social channels to get a closer look at the figures – Meredith has been working with McFarlane’s team to keep the info coming. I’m also, as always, at work behind the scenes working on partnerships and other efforts in the hopes of bringing you cool stuff someday. As usual, I can’t tell you about everything just yet, no matter how excited I am. So for now, I will leave you with a question, which I am just asking for a friend, no reason…How do you wear you video game tee shirts – what do you wear with them, do you do casual or fashionable? What makes a gaming tee become a favorite for you? Tweet me your answers (@RikaConfesses), bonus points for pictures! I hope your February was fun and full of love, whether it’s platonic, romantic, or eldritch – whichever floats your goat. 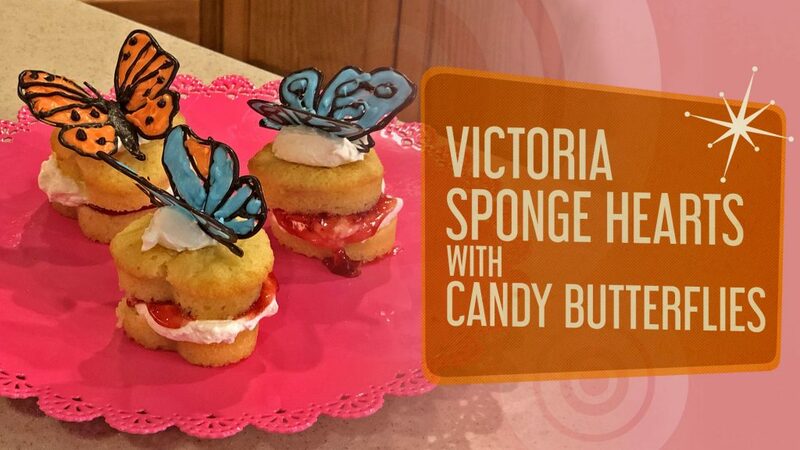 In publishing news, I helped Elisa and Meredith make Victoria sponges and candy butterflies to celebrate Valentine’s Day on the We Happy Few social channels. They were delicious and surprisingly easier to make than I would have thought. Other than that, I’ve mostly just helped out organizing internal publishing assets to make sure we can quickly create awesome screenshots and image assets for future use. Hi, everyone! February was a very busy month for User Research; we spent the first half of the month preparing for and conducting a week-long playtest for We Happy Few, and the second half analyzing the data we collected and preparing multiple reports for our partners at Compulsion Games. As the Compulsion Team mentioned in their recent journal update, this playtest focused very heavily on Arthur’s story and gameplay. In the past we have conducted a number of playtests that examined how new players were onboarded to We Happy Few’s gameplay mechanics and narrative (i.e. how well the game teaches and reinforces core concepts and features to players fresh to the content); this playtest, conversely, went beyond a couple of hours of gameplay to examine the entirety of Arthur’s story from the end-user perspective. To collect data on the full extent of Arthur’s story, we needed to conduct a playtest that spanned multiple days, and to accomplish that we hired what we internally refer to as Playtest Interns. 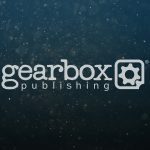 Normally at Gearbox Publishing, we conduct day-long or two-day user tests that seek to accomplish very specific goals; we recruit playtesters from our Dallas-area database and provide unique swag as a thank-you for their time, effort, and feedback. Playtest Interns, however, are recruited via job posting, are interviewed and vetted, and then hired as contractors to provide critical feedback as end-users and gamers. The group we hired for this round of We Happy Few testing was fantastic, and they provided us and the team at Compulsion with an immense volume of written and trending feedback throughout their stay. The “First Day Survey” stepped the interns through their onboarding experience with We Happy Few, and, much like in our previous playtests, asked questions related to the tutorials and introductory areas of the game. The “End of Day Survey” was completed at the close of the interns’ first, third, and fifth days with us (i.e. Monday, Wednesday, and Friday evening), and aimed to capture high-level evaluative feedback, comprehension of narrative, mechanics, and features, and user metrics across a range of topics. The “Impressions Survey” was used as an ad hoc pulse-check of the interns’ progress and understanding of the game, and was implemented multiple times throughout each day at key temporal junctures. These data were used to understand trends in sentiment and overall impressions of content as the playtesters progressed through the game. The “General Survey” was a self-paced series of questions and topics designed to afford the interns an opportunity to provide feedback on features, moments, or points of interest as they were encountered; we trained the interns to fill out this survey after completing missions, encountering new characters or enemies, discovering new story information, etc. The interns filled out this survey multiple times each day, providing insights into their learning and mastery of the game. In addition to providing plenty of written feedback, the interns had two opportunities during the week to speak directly with Sam, G, David, and others at Compulsion about their experiences. During our second group discussion, nearly the entire Compulsion team was present via Google Hangout! Nick, Paul, Louis, and the rest of the Publishing QA Team were instrumental in the preparation and execution of this playtest – we couldn’t have accomplished this test without them! David, G, and especially Sam at Compulsion were phenomenal partners in helping provide to us a build, notes, design intent, and answers to many, many questions! Thank you to everyone who assisted in this playtest. The reports that the User Research Team generated based on the data we collected were extensive and covered a wide range of topics, from narrative and character comprehension to pacing, features, and game-feel throughout all of Arthur’s story. After we delivered the reports to Compulsion and Gearbox Publishing stakeholders, we held a call with them to discuss the data; our partners at Compulsion were fantastic about consuming the report and providing their interpretations and next steps based on the user feedback. Next up we are conducting another onboarding test to see how iterations to the beginning of the game impact player learning and comprehension. Later in March the team will be attending the annual Games User Research Summit in San Francisco; this summit brings together user researchers from across the industry for academic exchanges, talks, posters, and meetings. We always come away from the summit with new ideas and methods, and we hope to learn something this year that can apply to future testing of We Happy Few and other projects.